BlackBerry Z10 specs leak ahead of launch | BlackBerry Blast! Just ahead of the official BlackBerry 10 launch, the full specs of the first BlackBerry 10 smartphone have been leaked. Techradar got its hands on official slides that detail the specs. The BlackBerry Z10 will feature a 4.2 inch full touchscreen HD display with a resolution of 1280x769. The Z10 will run BlackBerry 10 OS on a snapdragon processor and include 16GB of internal storage with 2GB of RAM. The rear camera is 8 megapixels with 5x digital zoom, while the front camera is 2 megapixels. 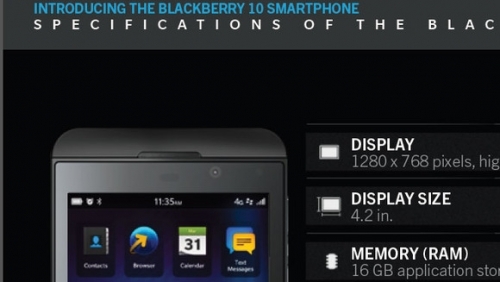 The Z10 will feature NFC and LTE.